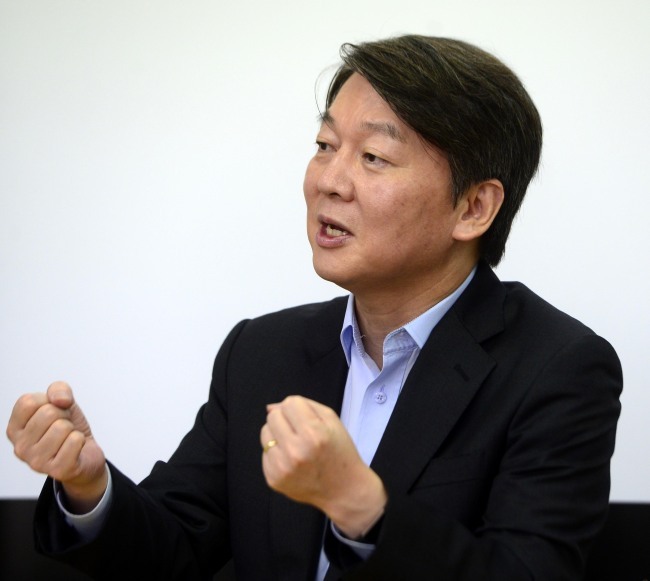 Ahn Cheol-soo’s political fortunes seem to have reached a low point lately. The party that he founded, chaired and represented during the presidential election in May is now battling record-low popularity, after a disappointing third-place finish at the presidential race and a humiliating scandal involving some of Ahn’s loyal supporters fabricating a smear campaign against then-presidential candidate Moon Jae-in. But in an interview with The Korea Herald on Tuesday, Ahn still talked about “new politics,” the reason he entered the tumultuous world of Korean politics in 2012. Now vying for the helm of the People’s Party, Ahn said his purpose of taking part in the party’s leadership race -- despite facing criticism -- is to grow his party to become a true alternative force in South Korea’s bipolarized politics. He called this “radical centrism,” when he declared his bid for the party’s chairmanship on Aug. 3. “By ‘radical centrism,’ I mean the party focuses on viable solutions that are not biased by left and right ideologies. Taking a side (in the left-right rivalry) would be much easier, but we should pursue the most responsible way of politics,” he said at his office in Mapo, northern Seoul. The term, which strongly emerged in the global political lexicon with the election of French President Emmanuel Marcon, was dismissed by his rivals in the party as an empty and abstract idea. So what could a radical centrist do differently in South Korea now? In explaining his approach, Ahn highlighted President Moon’s disputed push to phase out nuclear energy in the country. While he agrees with Moon on the direction of the country’s energy policy, he said he would focus more on alternative energy sources, rather than the drastic move to shut down nuclear reactors. The country would have to invest in renewable energy sources, develop technologies that cut down power consumption and also encourage people to use less energy, he said. The use of nuclear energy, which takes up a third of national consumption, would be gradually reduced with inspections every three to five years, he added. On the national security front, Ahn insisted that the US military’s strategic assets should be located on the Korean Peninsula at all times, but dismissed the main opposition Liberty Korea Party’s call to bring in tactical nuclear weapons. With locals elections slated for June next year, there is already talk of a merger between People’s Party, holding 40 seats in the 300-member parliament, and Bareun Party, a center-right group with 20 lawmakers, in order not to wipe out by two main political forces -- the ruling liberal Democratic Party of Korea and the hardline conservative Liberty Korea Party. However, Ahn said the party’s priority should be on how to win back trust from its supporters, though he admitted that the two could unite on policies. “It is not the time for the People’s Party to think of political maneuvers, like forming an election coalition with another party. We have hit bottom and the ultimate goal for us should be to stand upright and have a strong identity of our own,” he said. 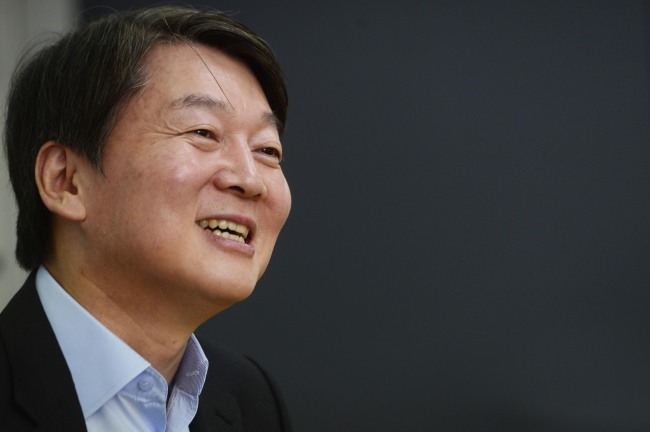 On the possibility of running for Seoul Mayor, he reaffirmed that he would do whatever he could to salvage the party. In 2011, he had considered candidacy, decided not to, and instead endorsed Park Won-soon, who won the race and was re-elected in 2014. In the latest poll by Realmeter, the People’s Party garnered 4 percent of approval, ranking last out of five political parties and falling behind the far-left Justice Party, which holds six parliamentary seats.